Eurovision | ESCKAZ.com live from Lisbon! Postcard: Rather aptly SuRie goes tea-picking before enjoying a nice brew. Some of these postcards are perfectly suited to the artists and their countries. Performance: Complete with her stage prop, SuRie shines and brings the song to life. It may even trouble the top of the second half of the scoreboard based on this performance. Postcard: Sanja and Balkanika team go wine-tasting in Porto. Another appropriate postcard sequence given the group's love of the grape. Performance: A deserved qualifier from last night, vocally they just keep getting better and better. Reverting back to the initial Nevena Ivanovic-designed costumes they first wore before they were refitted for the semis, they really shine. From the betting odds, it seems it may have come in at 10th place in its semi but it is worthy of a good placing tomorrow night. Postcard: Another country walk with waterfalls and forests before Michael paraglides. Performance: Solid all the way vocally. One of the better performers of the Big Five on the scoreboard this year? Postcard: Eugent takes a gondola-style boat trip. Performance: Incredible vocal - as always - exactly why he has earned his place in this final. Great song, powerfully delivered. If the contest was judged solely on vocal ability, Albania would be beating their best finish (5th) of 2012. Postcard: More scenery and a funicular ride for the French duo, before busking. Postcard: Carnival time for Mikolas Josef. Performance: Still lacking the gumph that the original acrobatics gave it, it will easily give the Czech Republic their best ever result. A finisher between sixth and eighth, or maybe a little higher on the night depending how it's received. Performance: The chorus and the chanting coupled with drum beats make this incredibly catchy. Could see it finish top 10, but unlikely to conquer Eurovision as much as the Vikings did Northern Europe all those years ago. Postcard: A quick rooftop and waltz around Lisbon before some guitar/banjo playing. Performance: Jessica can relax a bit now after weathering the storm and making it through after much undeserved and unfair criticism in the last week or so. Some lovely vocal adlibs - especially in the second verse - and the vocals will be spot-on come tonight for the juries and tomorrow. A top-ten finish should still be in the offing - especially if she continues to sparkle like this. So here we are after all of last night's drama - the dress rehearsal for Saturday's Grand Final (and of course, tonight's all-important Jury Final). Ana Moura kicks off the show, treating us to some Fado. Salvador Sobral won't be performing his segment today we've been informed, as we are running a little late. Mariza then takes up the Fado reins, with drums and drummers-a-plenty surrounding her. The flag parade of the 26 finalists is next, with the flag-bearers walking the outer perimeter of the circular stage before the acts move to the Green Room. Filomena Cautela, Sílvia Alberto, Daniela Ruah and Catarina Furtado then introduce themselves and as standard, briefly explain the voting and display the running order with the graphics for those watching at home. Postcard: Melovin takes a cliff-walk before horse riding. Performance: Melovin kicks us off lying in his coffin before being released from it as part of the staging spectacular that we so often see from Ukraine. He's in good voice and it makes for an excellent opener while his coffin burns as he sits at the piano. Should be a top 10 finisher. Postcard: It's a romantic country walk ending with a meal boiled underground in a hot spring for the Spanish duo. Performance: The staging is classic and Alfred and Amaia are in fine voice. Although it's unlikely to trouble the top 10 on the night, it sounds great in the hall. Postcard: Lea visits the very windswept and grey Azores. Just as well her pink hair was there to brighten up the weather. Performance: Very much more of the same fantastic vocals and perfectly executed choreography (including THAT "malfunction" break) that saw her make the final last night against the odds and many of the press predictions. The cult of Hvala, ne! is now a Eurovision phenomenon regardless of Lea's overall placing on Saturday night. Postcard: Ieva takes an antique car out on a quick spin down a country road. Performance: Ieva's delicate vocals shine in the darkness and her husband can give her her first on-stage embrace as a finalist. Outside shot at top 10 possibly but it's likely that its high placing on the betting market is due to a slight skewing from Tuesday's semi-final's voting demographic. Postcard: Cesar takes a mountain bike ride through small country villages, ending at a viewing point. Performance: Cesar seems a lot more relaxed now (as is so often the case with many a qualifier). The pressure gone he gives his best vocal performance to date. Austria is unlikely to trouble the top half too much, but solid it is. Postcard: A country walk for Elina before a sheer-cliff face rock climb. Performance: Impeccably delivered and with a mesmerising light show within the dress. Should sit mid-point in the first half of the table come 11pm on Saturday night. Postcard: Mr Fairytale is given a spraypaint task. Performance: As professional as slick as we've come to expect from Alexander Rybak, the song without any sort of notable lyric (ironically) and its on-screen graphics, sits early on in the running order but is still likely to put him on the cusp of the top 5 - despite the betting market effectively deserting it as a serious contender overnight. Postcard: The girls put a hard day's graft in with the Portuguese Navy. Performance: Claudia is strong vocally and brings the song to life a lot more than we've seen in previous rehearsals. It may pick up a few thanks-for-having-us votes but something around a 20th-place finish would be my prediction for this one. However, the girls have done the home nation proud. Now there's a short break before we see songs nine to sixteen performed. Using the benefits of the Lisboa card given to all press-members (valid for 24 h from the first use, when date will be marked on it) me and Maxim have planned today a trip through Lisbon points of interest. We've started with the Pantheon, we already were there in front of the building a week ago, but now we actually got inside. It was quite an interesting visit to the history of Portugal and a majestic building. "The National Pantheon, housing the tombs of Portugal’s major historic celebrities, is located on the original site of the church of Santa Engrácia. Founded in the second half of the 16th century, the building was totally rebuilt at the end of the 17th century by the architect João Antunes. 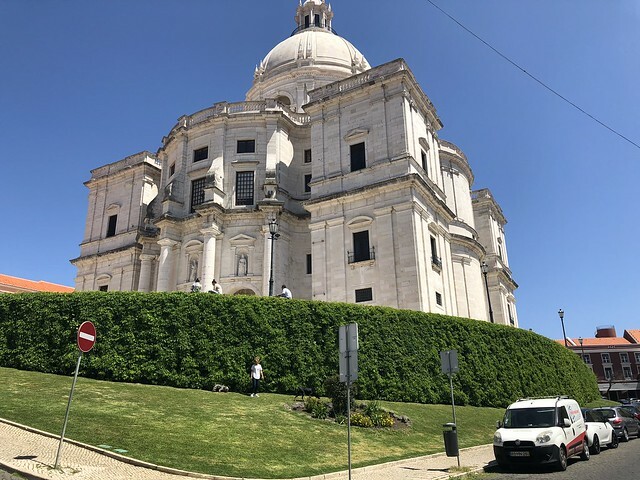 Even though it was never used as a place of worship, it still preserves, under its modern dome, a majestic nave with a polychrome marble decoration typical of the Portuguese Baroque architecture. 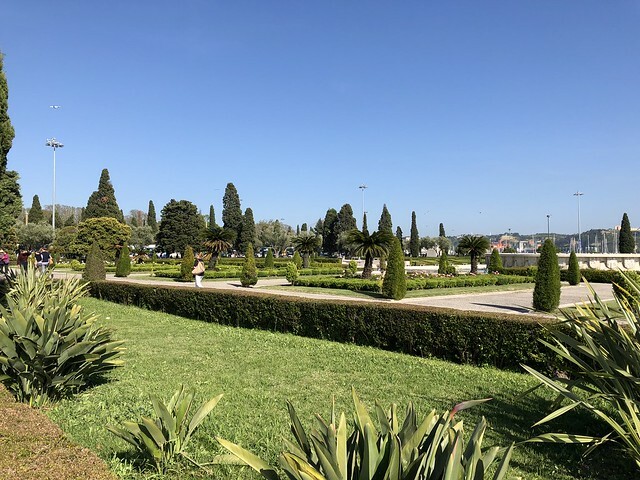 Being an icon of Lisbon’s cityscape and having a privileged location, as it overlooks the city’s historic centre and the river Tagus, it is listed as a National Monument"
"The personalities entombed here include the Presidents of the Republic Manuel de Arriaga, Teófilo Braga, Sidónio Pais and Óscar Carmona, Presidential candidate Humberto Delgado, writers João de Deus, Almeida Garrett, Guerra Junqueiro, Aquilino Ribeiro and Sophia de Mello Breyner Andresen, fado singer Amália Rodrigues, and footballer Eusébio"
Next, and we made a huge mistake there, was Teatro Romano. Not because it was uninteresting, it actually was fine, but to get from Pantheon there you have to climb a lot. We calculated that we had to do 30 floor climb on that day. 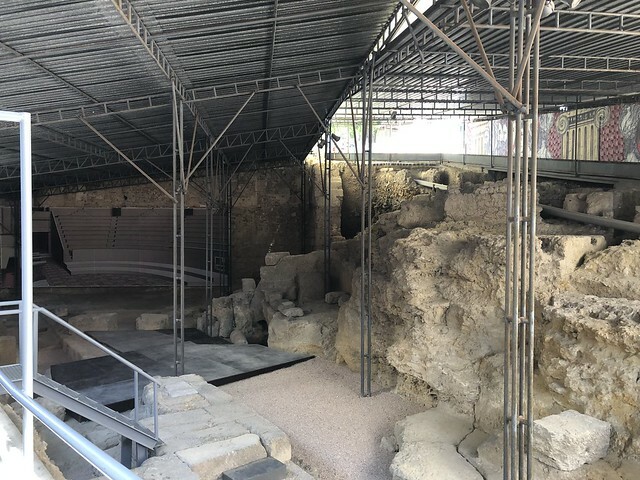 The museum is made of two parts: excavation site and ruins itself and the museum demonstrating antiques discovered on the site. "The Roman Theater was built in the 1st century, at the time of the Roman emperor Augustus . It was rebuilt in the time of Emperor Nero, and during the reign of Constantine was partially dismantled. Abandoned in the fourth century, it remained buried until 1798, the year in which the ruins were discovered after the earthquake of 1755. The object of several archaeological campaigns since 1967 there have been recovered part of the benches, the stage and a large number of decorative elements. The museum itself is housed in a seventeenth-century building in the probable area of ​​one of the old theater entrances"
I was a little emotional for Moldova, having followed them from the National final until their arrival in Lisbon and backing them for a top 10 place - I now feel they could go one better and place in the top 5. They would be overjoyed simply to qualify - so this is great for them. Ukraine. Possible winner of the televote in this semi, kinda deserved on this performance, even though I am not a huge fan of the song. Why do Ukraine always bring it with their staging?